In the late 2000s the U.S. financial system nearly collapsed as a result of a runaway derivatives fueled housing market. While Americans were mostly tuned into American Idol and watching extensive coverage of Paris Hilton on the nightly news, a handful of uber-rich bankers brought America to the edge of financial ruin. You may have heard the bits and pieces about Bear Sterns and Lehman Brothers and AIG going bankrupt, and perhaps you even noticed when the Bush and Obama administrations bailed out these institutions with your money, or maybe even you knew someone who lost their home to foreclosure or had to get out of their home with a short sale, or maybe they just walked away. Yeah, that financial crisis. Inside Job is the Academy Award winning documentary that explains how we got to the point of financial Armageddon and what we did (or didn’t do) in response. It’s a scary film, especially since the lesson of the film is that we haven’t made any substantial changes to our system to protect us from this sort of scam again and nobody (seriously…nobody) has gone to jail or even been indicted for crimes that clearly took place. In fact, those responsible have been summarily rewarded with huge bonuses and cushy jobs in the Obama administration. Frankly I’m tired of politicians and “conservatives” talking about the merits of laissez faire economics. “The market will take care of itself,” they decry and “Government regulation is socialism,” they claim falsely. We got into this mess beginning with deregulation of the financial sector beginning in 1980 with Reaganomics and it has gotten worse under every administration since…up to and including the Obama administration. Deregulation and self-monitoring is the problem and the solution is to go back to regulating what the financial services industry can and can’t do with our money. And it should start with removing the foxes from the hen house. I thought it was awful when George W. Bush installed coal and oil executives to monitor our environment, but this is worse. Nearly every major player in government with anything to do with monitoring our economy has a history of working with, lobbying for, or even being CEO of the very banks and brokerages that they are supposed to be watching over. It seems the only qualification needed to head the treasury or be chairman of the federal reserve is to have worked for Goldman Sachs. Perhaps the reason we’re so ignorant of what’s going on is that these are complicated issues. None of us can hope to fully understand derivatives and credit default swaps. But all you really need to know to understand them is to follow the money…and the money always ends up in the hands of the wealthiest Americans. I’m no conspiracy theorist, but it’s hard not to imagine there is some boardroom full of rich old white men laughing their asses off over this whole fiasco. 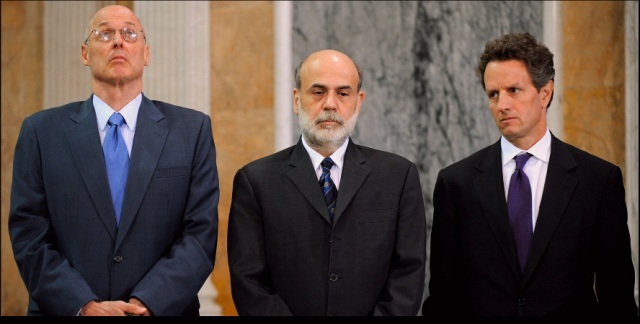 Why should we trust the likes of Geithner, Bernanke and Paulson? And Inside Job even makes the case that we can no longer trust academia as these guys are also financially connected to the Goldman Sachs’ of the world. Inside Job will piss you off — unless of course you are the CEO of Bank of America in which case you’ll probably think it’s a comedy. This issue should be non-partisan, as even the most conservative of us are still probably not part of the top 1 percent. We’re being fleeced and it’s only getting worse. What’s more, the mainstream media isn’t even interested. So far the only decent reporting on the financial meltdown has been by Rolling Stone reporter Matt Taibbi, who for years has been expertly chronicling these crimes. And I have Michael Lewis’ book The Big Short on my reading list as well, which is supposed to be a solid explanation of all this. If the growing disparity between rich and poor in America isn’t enough reason for you to re-think your love of Capitalism run amok I’m not sure what is. I for one am not afraid to say I think we need to reconsider our financial system and move toward a more socialist system. Electing more of the same politicians isn’t the answer. Anyone else for a revolution? HBO’s new movie, Too Big to Fail, is another interesting look at this situation. Scary to see just how close we were to calamity. Also, check out The Big Short, Michael Lewis’s book.